Hair loss information about causes and treatment options, both standard and alternative. Also a discussion forum for general questions and comments. I blame the following autobiographical tale on several regulars to the Discussion Forum who suggested that I post some photos of myself at various stages of my life. They thought that these photos would "humanize" me. Anyway, I didn't need too much prodding. When you reach a certain age, there is a tendency to tell your life story, and perhaps jazz it up bit too. So here goes - through the decades. This first photo was taken at Santa Monica Beach in 1950 when I was 19. I was losing a lot of hair then in the temporal area on both sides of my head. The thinning was symmetrical. I had no bald spots, but still the obvious thinning was embarrassing. No one took my photo in those days unless I had a cap on or something wrapped around my head. I was extremely sensitive about my hair as I'm sure many of the readers who come to this site will understand. 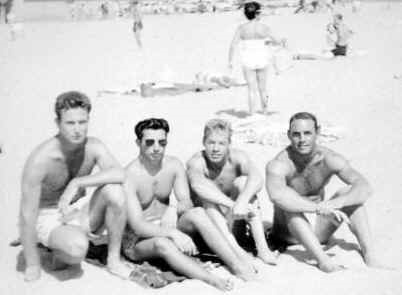 This photo was taken a few years later just north of Santa Monica at what we called "Girl's Beach" because there were always many good-looking girls there. I'm the guy on the left. My hair was now thick and I was happy with the way I looked. 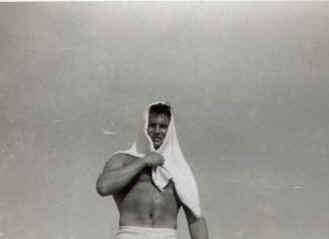 My body was thinner because I gave up weight training and was doing jogging and ocean swimming. The guy with the blond hair, second from the left, is Frank Smitha. He now has a world history website. The guy on the right is Al Freemon. He died from cancer in 2015 before Christmas - a true friend. This photo was taken ten years later when I was in my thirties. 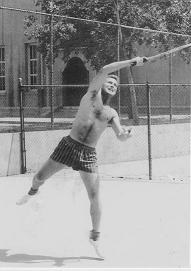 I was playing tennis every day during this decade. My hair was in good shape but my eyes were no longer 20/20. I had a lot of hair on my body. I still do. Skip ahead about thirty years. Now I'm into ballroom dancing and traveling. My hair is a little darker because I no longer spend hours in the sun playing tennis or swimming. Still have thick hair. Still doing that dumb scalp exercise. 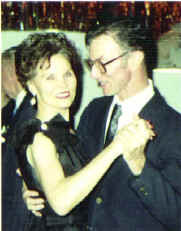 Lisa, the woman I'm dancing with, and I have had many happy years together. I was lucky to have met her at a ballroom in Chicago. 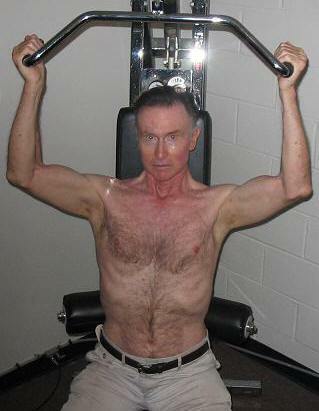 This photo was taken a few days before my 74th birthday. As you can see, my hair is slightly receding in the left temporal area again. This happened when I was 19 years old too. But now because of my age it's called senescent thinning. As you can also see, my hair is getting a little gray, especially the sideburns. Eventually age does take it toll on hair; the challenge is to keep it as many years as you can. When I was 19 and saw my hair vanishing I was more angry than depressed (I rarely get depressed). Of course I was troubled, too, because I felt that physical appearance was critical. I thought if I lost my hair the girls would no longer like me. You can see that I had the motivation to do something to keep my hair. I found the hint I needed in Gray's Anatomy at the Glendale Public Library: "By bringing alternately into action the frontal and occipital portions the entire scalp may be moved forward and backward." That little gem from the chapter about cranial muscles in Gray's Anatomy set my mind working. I slowly was able to gain control of my scalp muscles - and the scalp exercise was born. I attribute my present full head of hair to this discovery at the Glendale Public Library over fifty years ago. So with the maturity, experience, and wisdom of 70-plus years, do I still think that physical appearance is critically important? I don't think it's critically important, but if you're bald, fat, and unhealthy, you're not going to be invited to the best parties (unless you're a Jack Nicholson). In other words, if your face and body are falling apart, people will not evaluate you positively; you won't evaluate yourself positively either. Don't feel bad though - there's always TV and a rich fantasy life.